Over 75 percent of Uganda’s population is under 30 years old. Out of 176 countries, Uganda is ranked 151 on the Corruption Perception Index. It’s a country with great needs – and great potential. In the middle of this is a woman. A woman uniquely positioned to impact change on a political level, as well as a grassroots level. This woman is Dorothy Kisaka, Senior Presidential Advisor to the President of Uganda and Governance Advisor to the Prime Minister of Uganda. She’s also the co-founder of Destiny Consult, which trains and mentors young adults. Over 400 young adults have graduated from the program, including the current Inspector General of the government of Uganda. 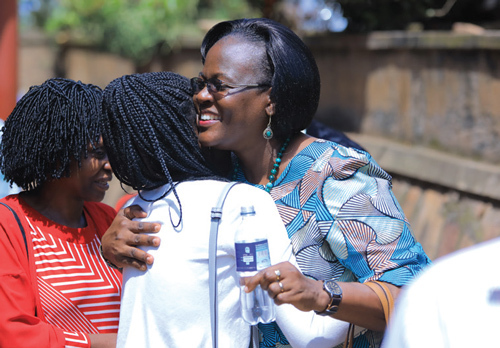 When Dorothy came home from Haggai, she helped revive Haggai’s Ugandan chapter of the alumni association and served as president for 10 years, training 270 leaders during that time. She and her husband Peter also started Destiny Consult – a year-long program for young leaders to experience training and mentoring through Bible-based curriculum that focuses on spiritual formation. When it comes to planning for the future, Dorothy has big goals. For Dorothy, her Haggai Leader Experience was the catalyst she needed to begin changing her country. The Haggai Institute advances the skills of qualified Christian leaders to more effectively evangelize their own people, and train others to do the same. We equip strategically-positioned leaders from all over the world to share God’s hope, His love, His truth, and His light. Haggai leaders face no barrier of language, because they’ve spoken it all their lives. They face no barrier of culture; they’ve lived it all their lives. And unlike most Western missionaries and evangelists, they won’t leave. The influence of Haggai leaders is immense. That’s because each commits to pass on the Experience by equipping at least 100 others. Our data shows the average rate is 159 in two years. Every leader in every country becomes a catalyst. Over 100,000 men and women have completed the Haggai Leader experience. They have established more than 500 local chapters in 110 nations, passing on Haggai skills and inspiration – in their own languages and at their own expense. To learn more about how you can help their work visit here.